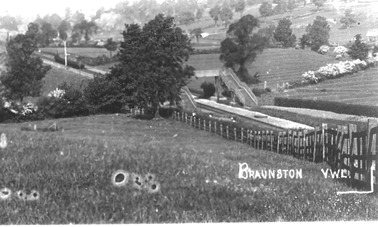 We know very little about early Braunston. A narrow outcrop of high ground points westwards from the Northamptonshire uplands upon which Braunston has developed. The ridge juts out across the flat plain of Warwickshire where once a vast inland sea, known as Harrison’s Lake, lapped the shores of the high ground. Fresh water flowed from springs and down the Bragborough stream. There was a commanding position from this ridge and it is reasonable to believe that pre-historic man would have found it to be a good place to live. King William I granted estates or ‘Manors’ to his tenants–in-chief to recompense them for the service given to him. These estates could be sub-let, or passed on marriage to other families. The Manor of Braunston passed to the Trussebot family early in the 13th century, being divided between three heiresses: Hilary, Agatha and Roesia. Roesia married Everard de Ros, a knight in Royal Service. William de Ros. (the 4th Baron) fought at Crecy in 1346 and went on a Pilgrimage to the Holy Land where he died in 1352. The stone effigy of a cross-legged knight in Braunston Church is thought to be that of William de Ros. The last Baron de Ros was Edmund. On his death, the Manor passed to Thomas Manners, Cupbearer to King Henry VIII, but was sold in 1554 to Gregory Isham of Pytchley, subsequently passing to his son Euseby. The will of Gregory Isham described the Manor House in Braunston where he stored wool for sale; the list of rooms in the house corresponds to the original parts of Tudor House in the High Street but without the timbered wing. 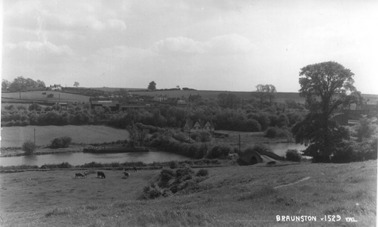 In mediaeval times, land around Braunston would have been farmed by the open field system; individuals were allocated single strips in the three large unfenced fields. The strips were about 220 yards long and about 8 yards wide, and cultivated on a three-year rotation with the third year fallow. Ploughing these strips resulted in the ridge and furrow effect seen in many of the fields around Braunston today. Livestock was grazed on the uncultivated land in the fallow year and on the commons and wastes which surrounded the open fields. 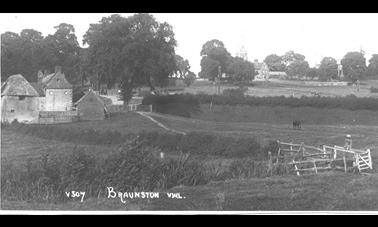 The village of Braunston continued as a farming community until comparatively recent times. Indeed, the date stones on some houses are evidence of the building of stone farmhouses in the 17th and 18th centuries. The rural way of life changed little until the coming of the canals at the end of the 18th century. 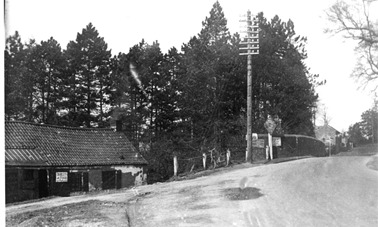 The turnpike road from London to Chester (now the A45) carried fast coaches and slower wagons. 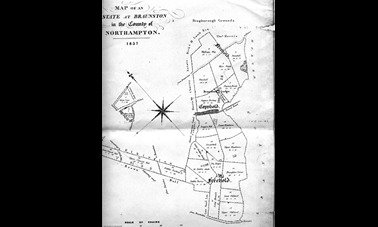 In 1895, a branch line of the London- to- Birmingham railway was completed running from Weedon to Leamington Spa with a station at Braunston.